Pomegranates are something I don't really have much to do with. I've always wanted to try one but I never really knew what to do with one haha. You're meant to eat the seeds right? They are known to be the most powerful anti-oxidant of all fruits along with a whole load of other health benefits which probably explains whay I have been coming across more and more pomegranate products recently, last week it was face cream and today its method cleaning products. method is a planet friendly company who create cleaning products, formulated with naturally derived, biodegradable ingredients. 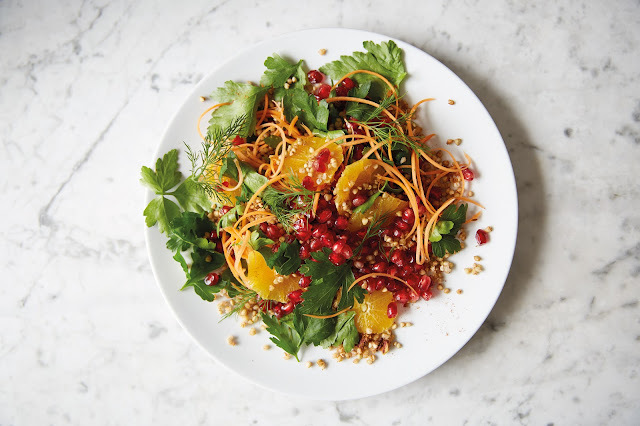 This February, they collaborated with the UK's leading food blogger, Deliciously Ella who created three recipes inspired by ingredients in the method range, pomegranate being one of those of course along with almonds and clementines. So what did she come up with? Firstly a warming almond soup - that is my kinda lunch, I love a soup! Also a colourful, healthy pomegranate and buckwheat salad which just looks so pretty, fun bright colours in food is a must! Lastly, for dessert, she came up with a cool, refreshing clementine sorbet. Sounds like a lovely summery menu to me! You can check out her recipes here. I will definitely be giving the sorbet a go when it starts to get warmer! Want to win for products from the range? method have kindly given me a bundle of products to giveaway here on my blog! Enter below as usual! The multi purpose cleaner gets my vote - use it everywhere! Multi Purpose is the most used! a multi purpose so I can whizz round . The multi purpose cleaner perfect for all uses. I use CIF kitchen and bathroom spray. I use a lot of Zoflora. Antibacterial wipes. They are perfect for everything! I have been know to clean a car with them.